In a blog post from September, we discussed the definition of direct marketing. Here we will take it a step further and focus on email marketing and why it is beneficial. Do you have a valid email list and are you reaching the right people? Are you using social media to take your message further? Is the cost worth the gain? 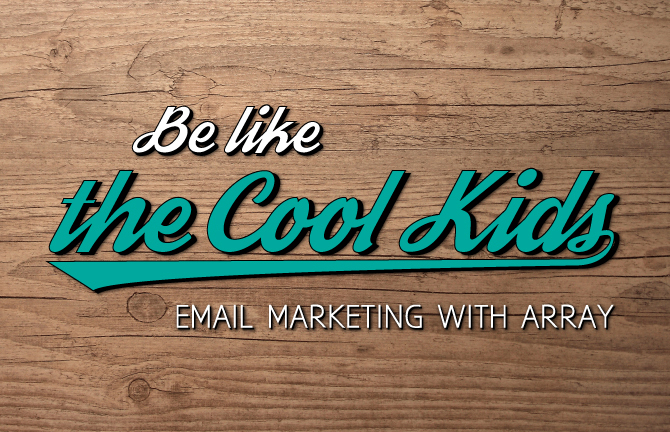 Here at Array, we use MailChimp for email marketing for a number of clients. MailChimp offers one of the most generous, free plans in the industry. With a wide range of easy-to-use features, it is fairly quick and painless to get your first email campaign up and running. ­Their unique ability to combine the techie info with a little humor makes them a win in our book (since we are mostly serious only part of the time around here!). With email marketing, you can easily set your campaigns to automatically post to all your social networking sites, such as Facebook, Twitter, YouTube and LinkedIn — just to name a few. Your subscribers can also share your message with just a few clicks on their own preferred sites. It’s all about engaging people and getting your company’s message out there! Specifically, one of the best features of MailChimp’s service is the Delivery Doctor which tests your campaign for red flags that might mark your email as spam. After all, if your email isn’t getting to your subscribers, the rest doesn’t matter! And as an added bonus, those cool kids at MailChimp have done all the work for you so your email reformats seamlessly for viewing on computers, tablets and phones. After your campaign goes out to the ‘interwebs’, be sure to track its performance in real time. MailChimp, for instance, collects and analyses your data, then provides excellent stats and graphs that can be exported to various types of files. Just like that, you’ve created a direct line of communication with your consumer and quite effectively increased your ROI. Not to mention you can show your boss all the cool stuff you’ve done!